Forlane 6 Studio is many things, and most notably a studio that is drifting: French artist Hortense Le Calves and her partner Mathieu Goussin have spent much of their time on their sailing boat, also called Forlane 6, which has enabled them to explore the Mediterranean over the past few years. The duo is currently based on Poros, a small island just off the shores of Athens and a mere one-hour boat trip from Piraeus. 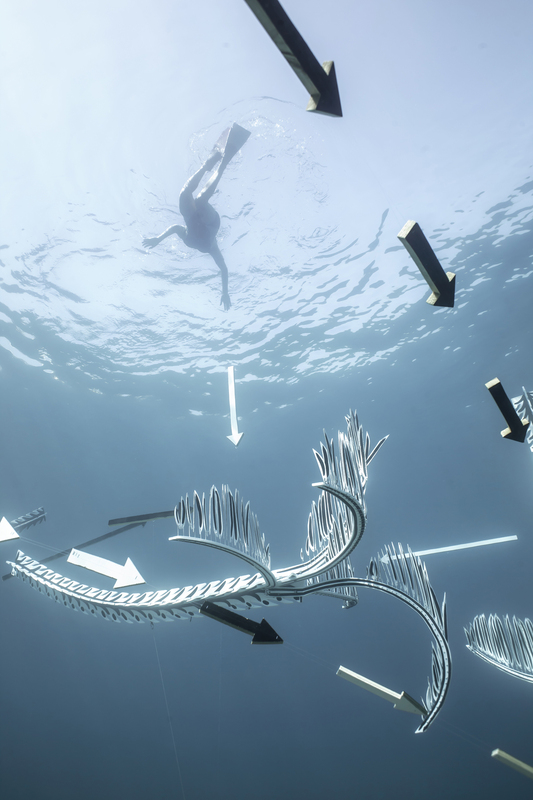 Fascinated by the mysterious properties of the underwater environment, Hortense and Mathieu create literally immersive installations that are placed on the bottom of the sea, and which can only be approached and visited by swimming. Last year they installed a large work off the shore of Hydra, which had to do with the concept of home; this year they return to the Greek island with their largest work to date, namely an installation of nine submerged palm trees that tells a story of migration and environmental change in a very poetic and visually captivating way. Eerily floating between seafloor and surface, the installation Disoriented (2017) was inspired by the humble coconut, and how it can float in the sea for months before reaching a shore and growing roots. This unusual type of plant migration is what prompted Hortense Le Calves to choose the coconut tree as the main image for this installation. For Hortense, the coconut tree is a symbol of resilience, not only because of the way its seed can travel for so long without disintegrating, but also because palm trees in general are very durable, as she remembers from her time in Southeast Asia and her memories of palm trees surviving storms without breaking. In fact, the palm tree is so strong that it’s often used to gauge the strength of blowing winds. For Disoriented, Forlane 6 Studio made nine palm trees in real size from wood, all cut and painted by hand at the studio’s workshop in Poros town. The sculptures were painted in black and white, as to create a strong visual contrast in the water and give a sense of collage—of objects that stand out from their background, that feel foreign. With the story of the coconut tree as a metaphor, Forlane 6 Studio created an installation that evokes the same feelings of uncertainty and loss that migrants and refugees have to cope with. The nine plants were placed horizontally and their plumage was rendered with detail in order to move as realistically as possible with the flowing currents. The result is like a herd of nine mysterious marine animals that hover in confusion in the middle of the ocean, with no clear sense of direction. By losing their roots, these plants simply drift with the currents, and their leaves seem to wave mournfully in the weak rays of sunlight. Lines of arrows, also cut from wood, have been installed around the palm trees like a sarcastic orientation interface, but sadly they too lead nowhere but simply flow with the currents and point to the void. The overall impression is one of stillness, but without being calm—a psychological paralysis caused by an overwhelming experience, a shock of larger-than-life proportions that appears even the more heart-wrenching in the calm weightlessness of the installation’s submarine condition. For Hortense Le Calves, a coconut is like a postcard from a distant land, but also a promise of a future life. A nomad herself, she traverses the sea that thousands of immigrants attempt to cross from east and south, many of whom without success. The full blow of the installation Disoriented hits you when you see these palm trees floating in the depths as the drowned bodies of African immigrants and Syrian refugees—their limbs lifelessly buoying in the pale light, and their lives, rootless and disoriented, unfairly and voicelessly lost. The installation Disoriented by Forlane 6 Studio is installed under the sea at the beach of Vlychos on the island of Hydra, until the end of the summer. To reach the beach you can either walk west of the town (approx. 30 minutes) or take the sea taxi from the port (every 30 minutes). You need a diving mask in order to see the installation.